Several people (two) have asked me about my feet and my choice of footwear. My feet are now good and most importantly I've had no blisters. I'm wearing lightweight Inov-8 Terroc GTX (i.e. they have a Gortex liner) and they have definitely been the right choice for me on a walk like this. You will be pleased to hear however that there remains unanswered footwear questions. There are some definite known knowns. The first and most important is that having something that is light on my feet is great. I feel mobile and more confident particularly when going downhill and even with a pack I can go down a lot faster. The second known known for me is that in a walking shoe, your foot moves more than it does in a boot and that, in particular, it moves around the heel and tendon. This might not be an issue but it is noticeable how the inner lining of the shoe has started to disintegrate and that the heals of my socks are also wearing out. The third known known is that weight matters. It's carrying weight over distance that makes you feel tired. Training before I set off toughened the skin on my feet but I couldn't bring myself to train with a loaded bag and the extra weight made a difference. Christine on her walk, was carrying hardly anything, weighs almost three stone less than me, and despite recent surgery on her knee, coped really well with the distances. For me the big known unknown is whether it has taken my feet longer to get used to load and distance because I'm wearing the lightweight Inov-8s. I felt the key thing was not to get serious blisters which would have wrecked my schedule. I didn't get blisters but my feet hurt big time for the first couple of weeks. My heal and tendon were really sore first on one foot and then on both and because my heal was moving in the Inov-8s I thought they might be the cause. Because my feet are good know, and as a whole have toughened up, and because I still have 145 days of walking to go (whose counting) than I'm sure I've made right choice. 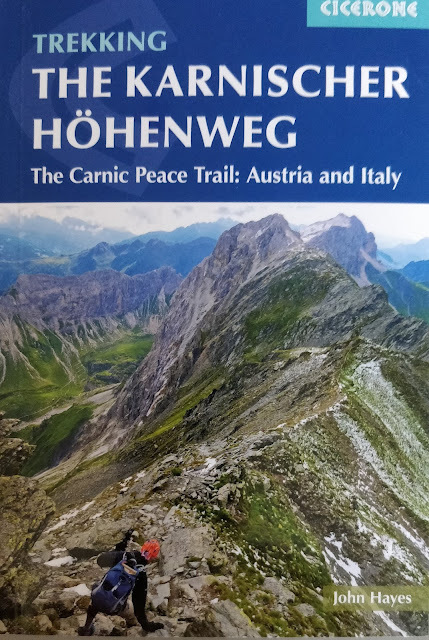 What I don't know is that if you weigh around 70 kilos and you slap on another 15 with a food and water laden ruck sack and then go intensely walking for just 2 weeks you would be better of with a boot that limits foot movement or a shoe. I'm sure I made the right choice for a mega walk, I don't know if that is the right choice for shorter one. So fortunately there is still plenty of scope to have an argument about boots or walking shoes, although light, I think, is definitely best. The big decision now is how much longer do I go with the current pair. I have a pair of new Inov-8 Terrocs (without Gortex) at home, and the pair I wore for training. My wife is joining me again on the 16th of April and I think she should bring out the new pair. Otherwise I will have to wait to Carcassonne before I get another chance to change over. I'm not sure if they will last that long. Current damage is a split toe guard, which I think is cosmetic, and some signs that various bits of stitching is beginning to go. 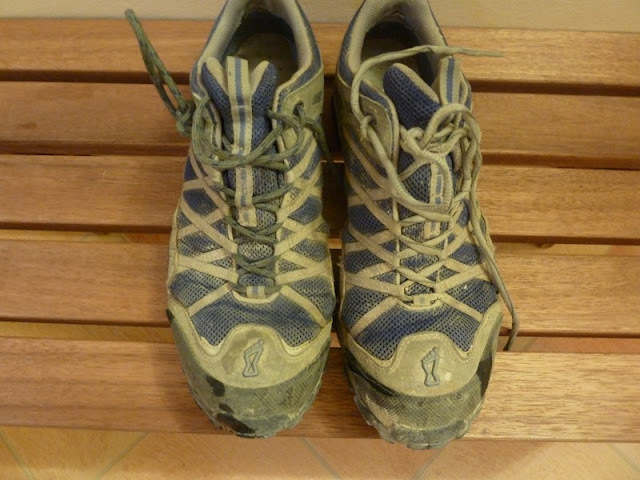 As well as the distance, currently about 750 kilometres, the shoes have had lots of mud, some of which was very limey and probably corrosive. By the time my wife heads home the current pair will have done about 1300 kilometres. The important thing about the feet is to keep them dry. Walking and friction with humidity is the worst thing for your feet. We have a spray called "Peusek" which you can buy on a pharmacy and given a spray before you start walking in the morning, keeps your feet dry for most of the day.